John Singer Sargent’s ‘Gassed’: more allusion than fact? 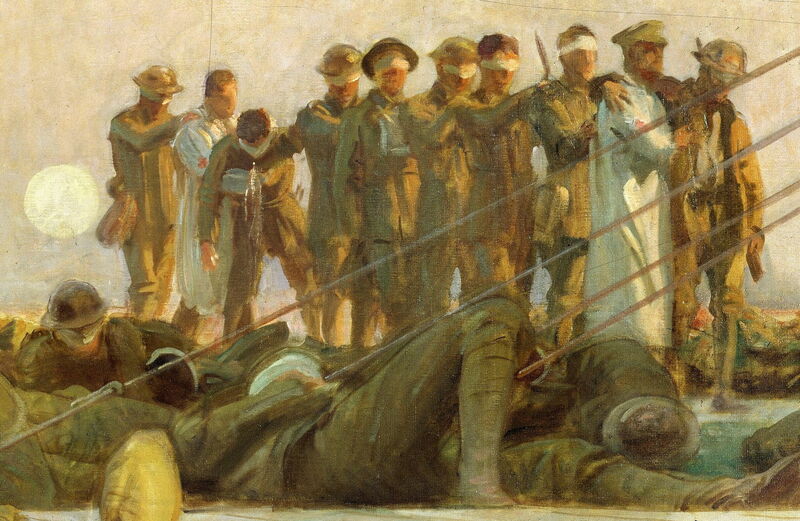 John Singer Sargent (1856–1925), Gassed (detail) (1919), oil on canvas, 231 x 611.1 cm, The Imperial War Museum, London. Wikimedia Commons. Some remember John Singer Sargent for his portraits of the most affluent in society. 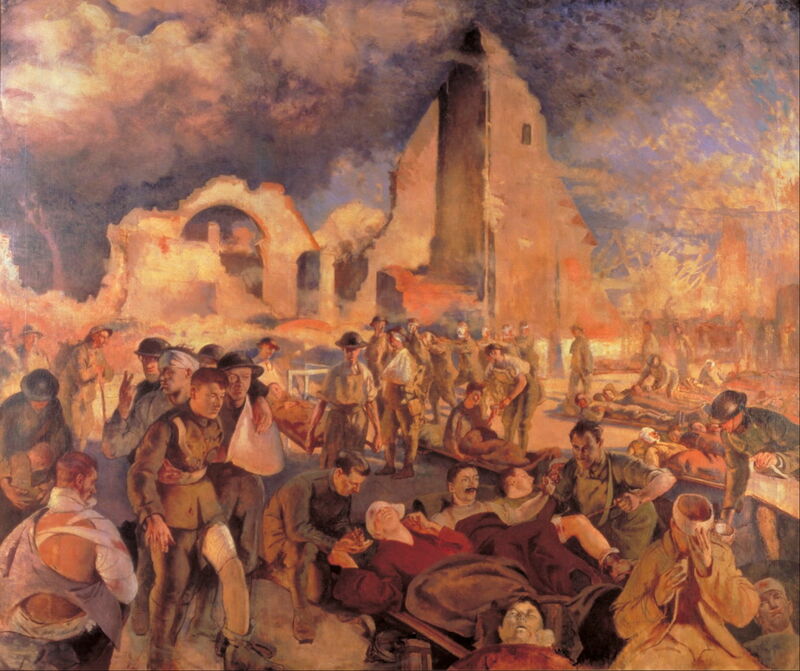 For many, though, his most memorable painting is his vast canvas showing the horrors of the First World War, in the Imperial War Museum, London: Gassed (1919). As with the work of all war artists, we tend to assume that this shows a real scene from the front, a hideous truth about that war. This article looks at the probable limits of that truth, and how much might be allusion. Sargent, as an American who had worked much of his career in London, was commissioned by the War Memorials Committee of the Ministry of Information in Britain to paint a large work showing Anglo-American co-operation in the war. This was originally destined for a Hall of Remembrance, which was never built, but which required a very large if not monumental painting. He set off for the Western Front with Henry Tonks, a distinguished British artist, in July 1918, and they visited units near Arras and Ypres. Likewise, Tonks made sketches, as a result of which he painted his An Advanced Dressing Station in France, 1918 (1918) shortly afterwards. 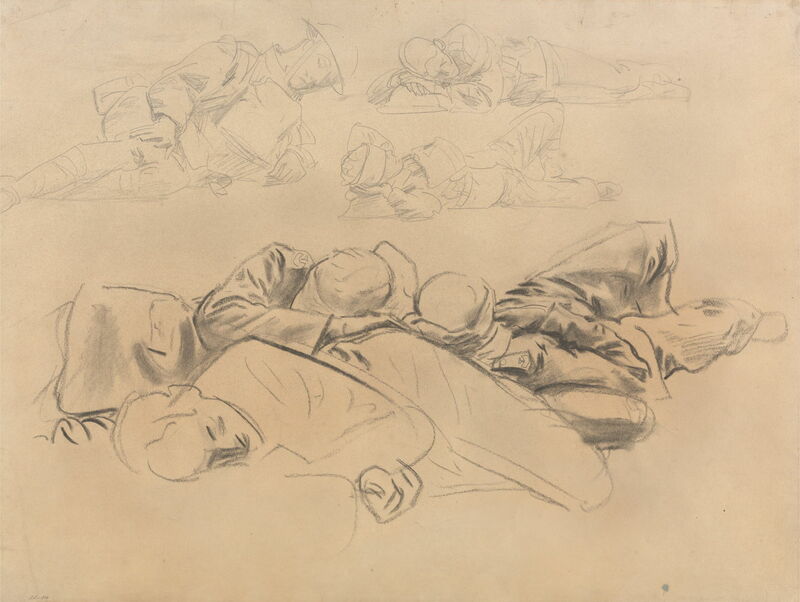 A very different image from Sargent’s, it shows one of the lines of gassed casualties in the centre of the painting, amid the more general carnage and chaos that you would expect of an advanced medical facility during such a battle. 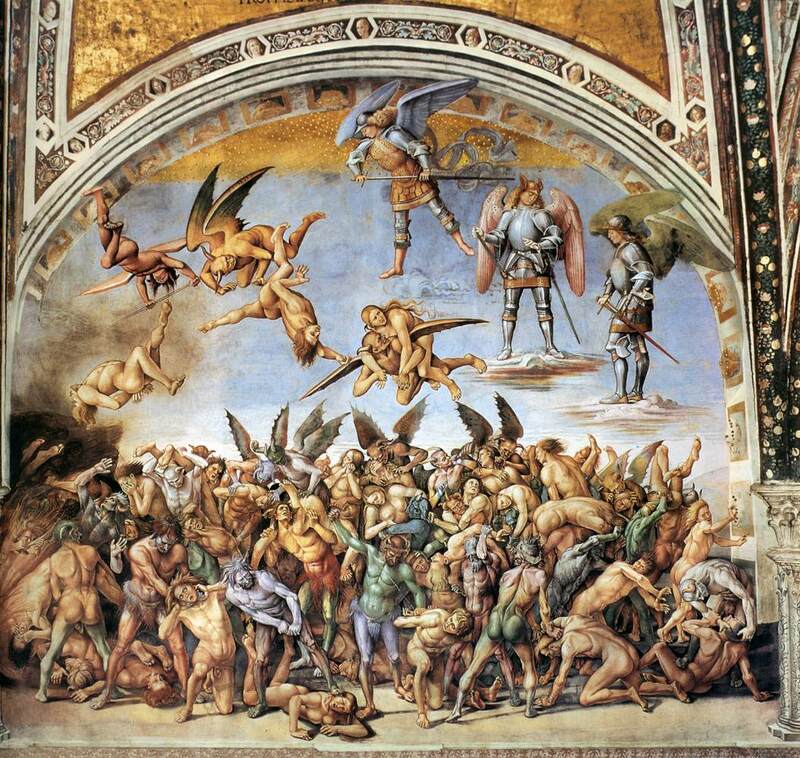 Luca Signorelli (1450–1523), The Damned (1499-1505, fresco, dimensions not known, The Chapel of San Brizio, Duomo, Orvieto, Italy. Wikimedia Commons. Pieter Brueghel the Elder (1526/1530–1569), The Blind Leading the Blind (1568), oil on canvas, 86 × 154 cm, Museo di Capodimonte, Naples. Wikimedia Commons. 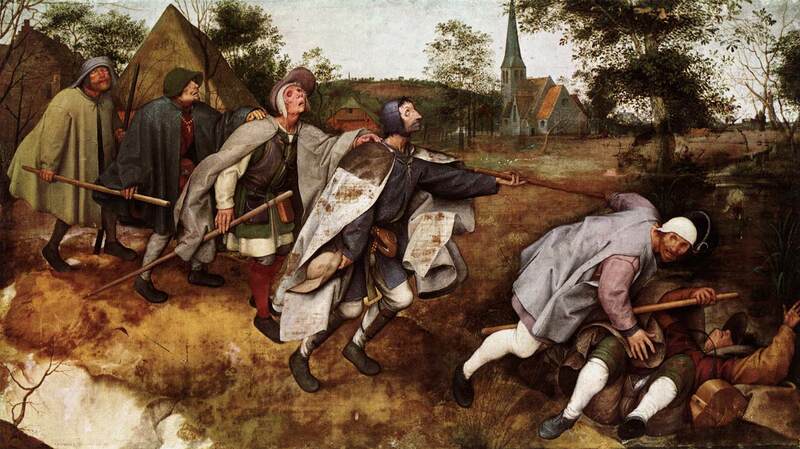 Sargent’s solution was to borrow from Pieter Brueghel the Elder’s The Blind Leading the Blind (1568), taking the lines of casualties that he had seen, and making them the central theme of the painting. Frederic, Lord Leighton (1830–1896), The Daphnephoria (1874-76), oil on canvas, 231 × 525 cm, Lady Lever Art Gallery, Liverpool, England. Wikimedia Commons. He wasn’t just alluding to Brueghel, but to Frederic, Lord Leighton’s Daphnephoria (1874-76) too, and to Leighton’s earlier Cimabue’s Celebrated Madonna is Carried in Procession through the Streets of Florence (1853-55), below. Frederic, Lord Leighton (1830–1896), Cimabue’s Celebrated Madonna is Carried in Procession through the Streets of Florence (1853-55), oil on canvas, 231.8 × 520.7 cm, The Royal Collection of the United Kingdom on loan to The National Gallery, London. Wikimedia Commons. This change to his commission required the approval of the War Memorials Committee, which he obtained before he started work on the painting in his studio in Fulham, London, in late 1918. I don’t know exactly when Sargent made each of the pencil sketches for his painting, but some may have been made near Arras, and others were clearly based on the professional models who he employed in his studio. 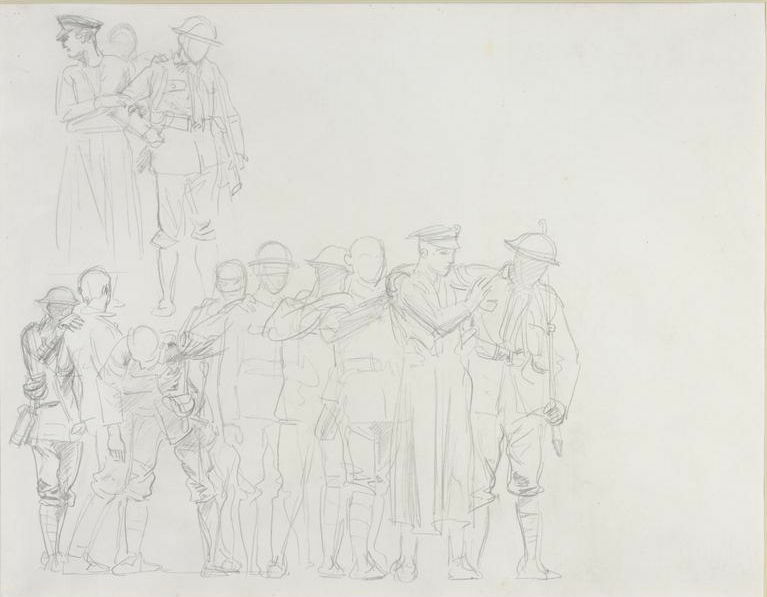 Many, like Study for Gassed Soldiers (1918), show details of different passages for the final painting, and could have been made in Arras or Fulham. The most interesting, though, are his assemblies of figures, such as Study for ‘Gassed’ (1918). This particular group was turned into the more distant line of casualties, at the right of the finished work, below. The Two Studies for “Gassed” (1918) in the Fogg Museum are more compositional in purpose, and show the shape of the final painting starting to form. Note, though, that the nearer line of casualties consists of only six (or seven) figures. In the finished painting, this becomes eleven, and forms the majority of the width of this panoramic canvas. John Singer Sargent (1856–1925), Gassed (1919), oil on canvas, 231 x 611.1 cm, The Imperial War Museum, London. Wikimedia Commons. There are several fascinating details in the finished painting, including the game of soccer taking place in the distance, seen in the detail above. Sargent probably added that as a reference to the activities of normal life, contrasting with the horror that is taking place throughout the rest of the painting. Most remarkably, there is only one pair of eyes visible in all the soldiers present, in the medical orderly near the head of the second line at the right. He even turned the orderly who is tending to the nearer line of casualties so that he faces away from the viewer. This emphasises the blinding effects of the mustard gas, and develops the painting’s theme of vision and art. Domenico Morelli (1823–1901), The Sermon of Mohammed (date not known), oil on canvas, dimensions not known, Museo Civico Revoltella, Trieste, Italy. Wikimedia Commons. Sargent may well have seen Domenico Morelli’s The Sermon of Mohammed (c 1895), which is remarkable for not showing any faces, and Gassed may thus allude to that work too. As in his portraits, Sargent’s greatest war painting tempers reality with his allusions to other paintings. I doubt very much that he saw what he painted here, but recomposed those elements of truth to produce a powerful masterpiece. That’s what make Sargent so special. Redford, B (2016) John Singer Sargent and the Art of Allusion, Yale UP, ISBN 978 0 300 21930 2. Posted in General, Life, Painting and tagged Brueghel, Leighton, Morelli, painting, Sargent, Signorelli, Tonks, truth, war, war artist, World War. Bookmark the permalink. John Singer Sargent’s ‘Gassed’ is on loan to the Pennsylvania Academy of Fine Arts (PAFA) from the Imperial War Museums for PAFA’s exhibition, World War 1 and American Art, running from November 2016 to April 2017. Thank you for letting me know. I sincerely hope that those who can get to that exhibition enjoy seeing this superb painting. There is no doubt that at times such lines did occur. What is in great doubt is whether Sargent ever saw or sketched them at the time. The photo which you link to, for example, was taken at a different location four months before Sargent witnessed casualties at the corps dressing station which he visited with Tonks. 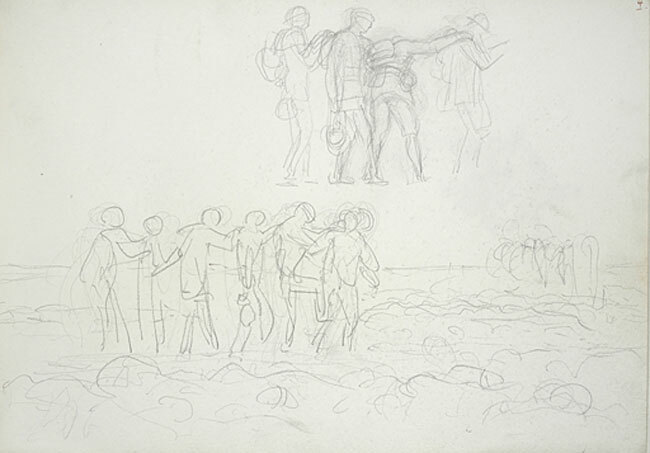 Shortly afterwards, using contemporaneous sketches, Tonks actually painted the scene which they saw, and although it does include some chains of wounded, it is very different from the scene which Sargent painted the following year, back in England. I do not think there is any good evidence that Sargent or Tonks saw a scene closely resembling that painted by Sargent in 1918-19 in his Gassed. Knowing Sargent’s career-long technique of referring to other paintings, I think that it is much more likely that the composition of that painting resulted from those references. It is a superb painting. It is not a work of fiction or imagination by any means, but I don’t think that it is a graphic record of what Sargent saw there at the time.